Acknowledgement: The Irving K. Barber Learning Centre is pleased to contribute to the promotion of this unique opportunity. We acknowledge the Haida Gwaii Higher Education Society’s website as the source for most of this content. 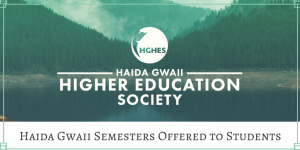 The Haida Gwaii Higher Education Society is an enterprising non-profit organization that develops and delivers transformative education inspired by Haida Gwaii. In partnership with leading universities, we offer students immersive, experiential learning opportunities in rural, resource-dependent communities in transition. Here the Haida Nation, island communities, and provincial and federal governments are working through complex joint management models towards reconciliation and sustainability. Drawing on Haida Gwaii’s legacy of innovation and leadership, HGHES offers a range of programming including undergraduate semesters, executive education and professional development courses, research opportunities, public lectures and workshops, and more. The Haida Gwaii Higher Education Society embraces a place-based approach; we see the social and ecological systems of Haida Gwaii as vibrant natural classrooms for our students to engage with, grounding course content in living, local case studies. We believe in working together and facilitating a rich collaboration between academics and local knowledge holders, supporting a meaningful learning exchange and the development of a broad perspective. As issues around the globe become increasingly complex, If students are from UBC, there is an agreement in place to facilitate registration. For non-UBC students there is an opportunity to earn UBC credits and transfer them back to the student’s home institution.